The 'MTF MA Cross' indicator comes from the time tested 'Moving Average Cross' strategy; with modifications. The strategy in itself is one that was derived from rigorous testing on what was profitable in a moving average cross. 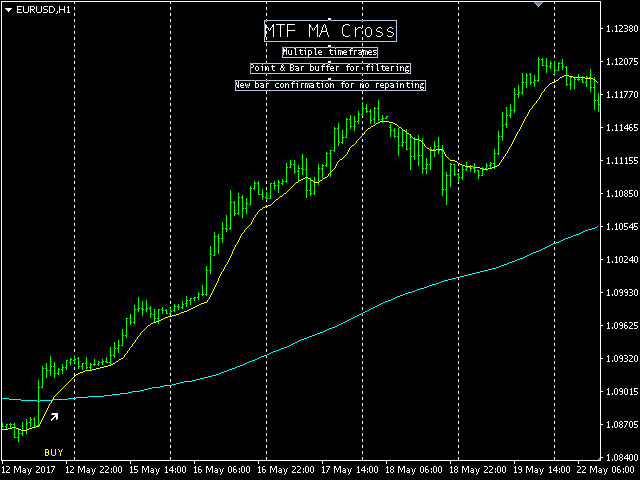 This indicator contains a fast and slow Moving Average cross with MTF & filtering settings. There are additional settings to filter signals out with how many bars and how many points. Indicator can be no-repaint when set with open prices & NewBarConfirm set to 'false'. Comes with Alerts & Email notifications. MA Fast Method = 1; - Simple, Exponential, Smoothed, Linear Weighted. MA Fast Period (# of Periods) = 10; - Periods of Moving Average calculation. MA Fast Price = 1; - Close, Open, High, Low, Median, Typical, Weighted. MA Fast Shift (# of Periods) = 0; - Periods of Moving Average shift. MA Slow Method = 1; - Simple, Exponential, Smoothed, Linear Weighted. 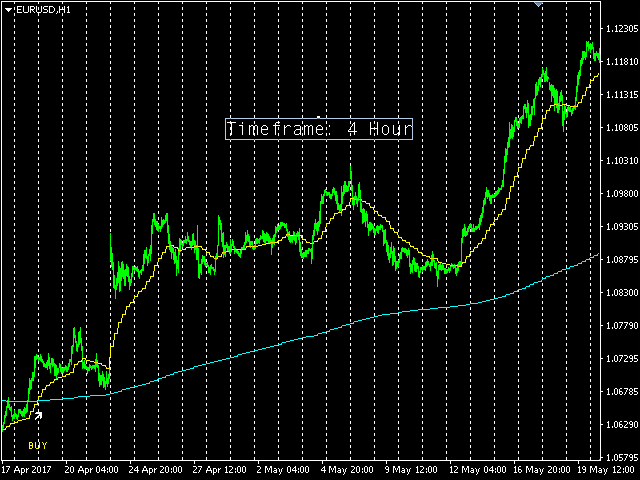 MA Slow Period (# of Periods) = 200; - Periods of Moving Average calculation. MA Slow Price = 1; - Close, Open, High, Low, Median, Typical, Weighted. MA Slow Shift (# of Periods) = 0; - Periods of Moving Average shift. Timeframe = 0; - Timeframe of Moving Average cross. PointBufferMin (# of Points) = 0; - Point buffer minimum of Moving Average prices. 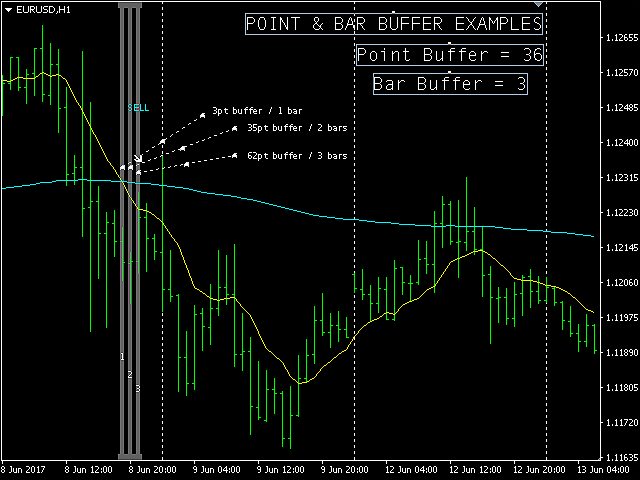 BarsBufferMax (# of Bars) = 1; - Bars buffer maximum of Moving Average prices. NewBarConfirm = false; - Signals of cross (true: confirmed at bar 1, false: confirmed at bar 0). Alarms = true; - Alerts (true: On, false: Off). E-Mails = true; - Emails (true: On, false: Off). SpacerZoom (# of Point Spacer) = 25; - A zoom (multiplier) of a point value for labels & arrows. This indicator produces Moving Average prices on buffers 1 & 2. The signals appear in buffers 3 & 4 as either a value or otherwise a value of 0. Please be sure to leave any ideas, tips and suggestions in the "Reviews" section and they may be included. Lower timeframes added; all timeframes possible of M1, M5, M15, M30, H1, H4, D1, W1 and MN. Alarms updated with specific timeframe and bid price on buy signals and ask price on sell signals. Inputs & code optimization; nothing new but faster!